Editor’s note: the following contains summaries of findings from the Gartner Magic Quadrant for Modular Servers, May 2015. The “Strengths” and “Cautions” were direct excerpts from the report. The report can be read in entirety at http://www.gartner.com/technology/reprints.do?id=1-2E6C56P&ct=150430&st=sb. Cisco is a major success story in the blade server market, with a $3 billion dollar business in less than six years. Cisco is one of the pioneers of converged infrastructure, propelled by its alliance with the VCE joint venture (now owned by EMC) and the policy management capabilities of UCS Director. Cisco has strong service and support that are backed by a respected and responsive engineering team. Cisco’s integrated systems success is not a prelude to multinode success. It will be challenged to expand into new markets, channel partnerships, sales strategies and vendor alliances. Cisco’s UCS must advance, expand and gain market acceptance regarding System Link, OpenStack, cloud and agility in Mode 2 rapid application deployments. Cisco lacks the portfolio breadth, market coverage and pricing leverage that its competitors with greater market share have accumulated along with greater market share. Gartner reports that Dell is a strong competitor with an extensive portfolio and a global indirect channels, they continue to lose market share in blade servers. In contrast, Dell has strongly addressed the growing multinode server market as well as market interest in hyperconvergence through partnerships with Nutanix, Microsoft and VMware. Dell is the second-largest provider of x86-based servers in the world and has a large global reach through an extensive partner network. Dell has good portfolio breadth and depth in modular servers. Partnerships and acquisitions have strengthed [sic] Dell in networking, storage and security, and the company has strong operating-system alliances with Microsoft and Red Hat. Dell is in the vanguard of Web-scale IT servers via its dense PowerEdge FX2 systems and the industry experience of its Data Center Solutions (DCS) group. Dell lacks a clear, public roadmap for integrating its multiplicity of products, and its inconsistent management tooling investment has cost the company enterprise credibility. Dell is investing in deep implementation and integration skills in large enterprise IT systems and solutions through its engineered solutions portfolio, but still lacks market recognition. Confidence in Dell’s consultitave [sic] sales and support capabilities remains low, despite increasing focus by Dell to improve competence in this field. Dell’s change to a private company may make Dell’s future strategies and financial results less transparent, making it harder for buyers to gauge the relative health of the company and its individual strategies. With less market scrutiny and accountability, Dell’s strategy is also more likely to undergo change in one or more aspects. HP is a highly proven blade server vendor, with market leadership in most countries. HP has a strong multinode server portfolio, which addresses node-based workloads that benefit from maximum scale-out, and good market knowledge within the company’s Hyperscale group. HP’s high-end Superdome X and NonStop systems are well-suited to challenging, mission-critical x86 workloads, including SAP Hana and Unix consolidations. HP must continue to demonstrate that continued investment in BladeSystem c-Class, which was launched in 2006, enables the product to remain competitive in “greenfield” situations versus blade solutions from vendors like Cisco and Lenovo, which are younger and appear to offer a longer viable life. With such a broad portfolio, HP (and its channel partners) frequently struggle to position products in relation to each other, creating confusion for data center managers who need vendor guidance on how to match the right HP product to the right workload. HP’s more specialized servers, like Moonshot and Superdome X, address a finite market that is not so proven, requiring prospective customers to validate use cases and demand references. Gartner summarizes the acquisition of IBM’s x86 servers by Lenovo and notes that it ended an 18 month period of uncertainty with the future of IBM. It also points out that although Lenovo bought a large “complex” portfolio of servers, they don’t have a storage offering, so they’ll have to work with 3rd party storage vendors to create a complete enterprise solution. Lenovo has a very broad portfolio of proven products with installed base strength in most countries. The PureSystems, Flex System and NeXtScale brands help to position Lenovo as an innovator in the modular server market. By employing several thousand IBM staff around the world, Lenovo has immediate localized expertise and the capability to execute complex projects. Lenovo can leverage strong relationships with systems vendors like EMC, as well as its continued alliance with IBM. Lenovo must rationalize a complex modular servers portfolio that includes legacy products like BladeCenter and iDataPlex, which have little new business potential but a large installed base to satisfy. Lenovo must demonstrate that it can retain the staff and channel partners that have been inherited through the acquisition, knowing that rival x86 server vendors will attempt to recruit where possible. While most expect Lenovo to be a formidable vendor of low-end x86 servers, Lenovo must demonstrate over time that the high-end market competence that IBM exhibited has not been diminished. Lenovo must publish — and execute against — credible postacquisition roadmaps to demonstrate that the previous IBM investment in engineering and product innovation will not suffer under new ownership. IBM was excluded from the report because of the sale of x86 servers to Lenovo and Oracle was dropped due to their products being mostly “carrier grade” and because Oracle announced the discontinuation of these servers in 2015. 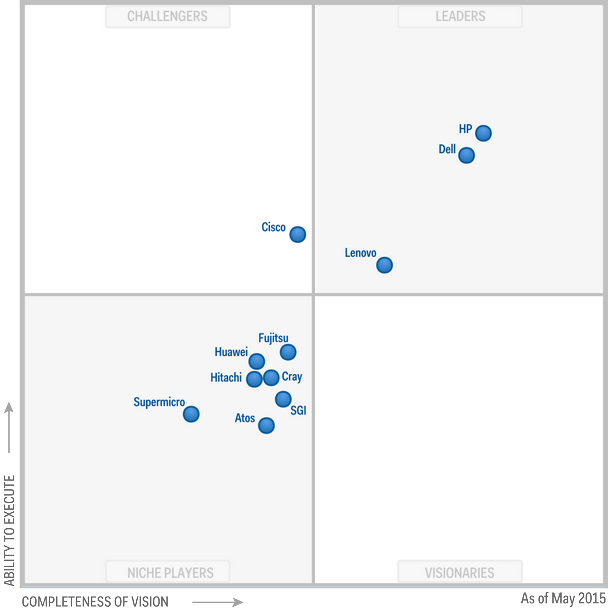 To review the full Gartner Magic Quadrant for Modular Servers, May 2015, please visit http://www.gartner.com/technology/reprints.do?id=1-2E6C56P&ct=150430&st=sb.